Lakeland Fellranger walking guidebook covering 35 summits in the Near Eastern Fells of the Lake District, including a variety of walks in the mighty range of hills including Helvellyn, Hart Side and Fairfield, that sit between Ambleside, Ullswater and Grasmere. The area is flanked to the west by Grasmere, Dunmail Raise and Thirlmere, and to the east by Kirkstone Pass, Patterdale and Ullswater. Each of the 35 fells has a dedicated chapter describing a plethora of walking routes of differing characters and difficulties (from wide bridleways up to easy scrambles), which can easily be combined to make ascents, descents, traverses or ridge routes. The chapter begins with a customised Harvey map that illustrates the routes, and shows ridge connections to neighbouring fells to assist in the planning of extended walks. In many instances pen and ink drawn diagrams show the routes from a given perspective to assist visualisation. The guidebook is fully illustrated throughout with clear elevation diagrams, detailed summit panoramas and lots of inspiring photographs. 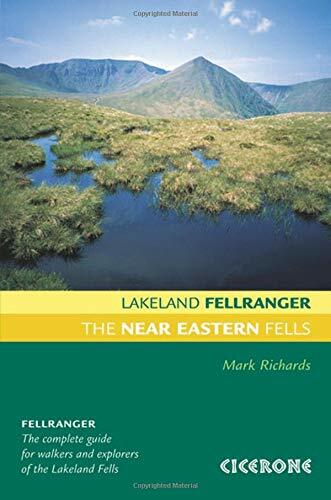 The Near Eastern Fells is part of the eight-volume Lakeland Fellranger series by Mark Richards. Together they provide a comprehensive guide to walking in the Lake District, with a selection of routes up more than 220 hills. Collins Lakeland Fellrangers are the only comprehensive, up-to-date guides to every path, crag, fell and valley in the Lake District. The area covered in this book, the Near Eastern Fells, ranges from Kirkstone Pass to Dunmail Raise. The first of Wainwright's celebrated guides to the Lakeland Fells appeared in 1955, and the last of the seven-volume set was published in 1966. These titles have remained unaltered despite radical changes to the countryside and a phenomenal increase in the numbers of people visiting the area. Collins Lakeland Fellrangers combine the personal touch found in Wainwright’s guides, with everything the modern walker needs. Traditional pen-and-ink sketches and hand-drawn maps are included alongside inspirational colour photographs, new maps and drections, and detailed diagrammatic panoramas. All this is packed into this easy-to-use portable guide. Author Mark Richards was one of Wainwright’s proteges and with the Lakeland Fellranger books, he proves he is a worthy successor. Cicerone's "Lakeland Fellranger" series is the modern rucksack reference for the discerning fell adventurer. "Fellrangers" are inspirational and thorough - and together the eight books in the series provide a comprehensive and contemporary guide to the fells of the English Lake District.The guides in the "Fellranger" series are ideal for practical use outdoors, and are equally useful for armchair planning. Each fell has its own dedicated chapter, and the variety of routes on the fell are carefully depicted on Harvey maps and fellscape diagrams. The scenic qualities of the landscape are illustrated by colour photographs and by detailed summit panoramas that help to underpin the reader's appreciation of these magical mountains.The Near Eastern Fells comprise the mighty range of hills, including Helvellyn, lying between Ambleside and Threlkeld. The area is flanked to the west by Grasmere, Dunmail Raise and Thirlmere, and to the east by Kirkstone Pass, Patterdale and Ullswater.